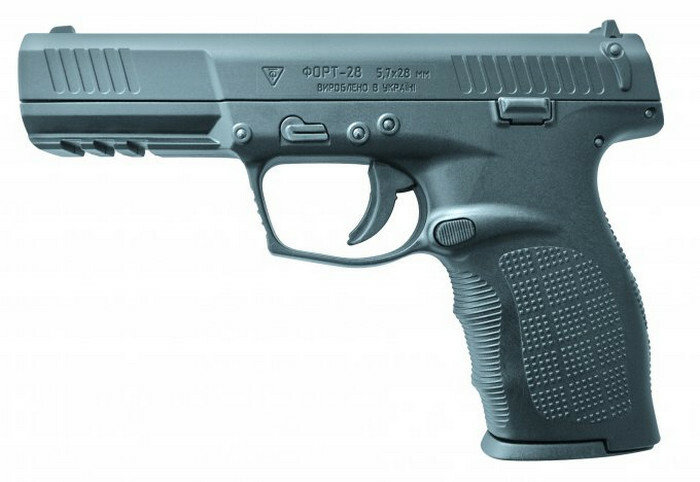 The Fort 28 pistol was designed by SIA FORT in Ukraine. It’s chambered for 5.7×28 FN pistol ammunition, like the FN Five Seven pistol and FN P90 PDW. This caliber of ammunition is manufactured in Belgium, not Ukraine, at least not yet. There’s no information about its mass production, although Fort does specialise in the production of ammunition as well as small arms. The Fort 28 pistol uses an indigenous delayed blowback system where the barrel is allowed to recoil for a short distance, but there’s no rigid link between the barrel and the slide at the moment of discharge. The pistol uses a striker fired, Double Action Only trigger system with no manual safeties and an automated trigger safety. The frame of the gun is made from polymer covered hard steel. According to Fort, this pistol has a capacious 20 round magazine.